We all look forward to sitting down around the dinner table with family at Christmas time. And cooking up a cracking Christmas feast is a tradition as well loved as it rewarding. 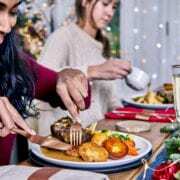 But between all the prepping, chopping, simmering, sizzling, frying, roasting and basting involved in filling that dinner table with delicious Christmas food, it can be easy to miss out on some of the magic of spending time with those people who make the day so special. So we’ve come up with a few new recipes to help everyone spend a little less time in the kitchen and a little more time relaxing with friends and family these holidays. 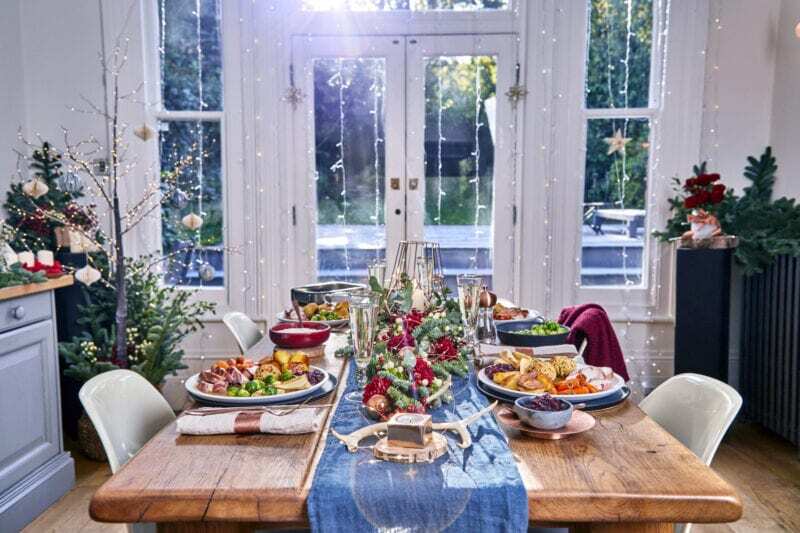 Here’s our present to you: the perfect Christmas dinner, with delicious trimmings like fresh winter veggies, sage and shallot stuffing and cranberry sauce, cooked from scratch and still on the table in under an hour. To create this Christmas classic you’ll wrap turkey breast in streaky smoked bacon, fry in a pan till crispy and roast in the oven until perfectly tender. 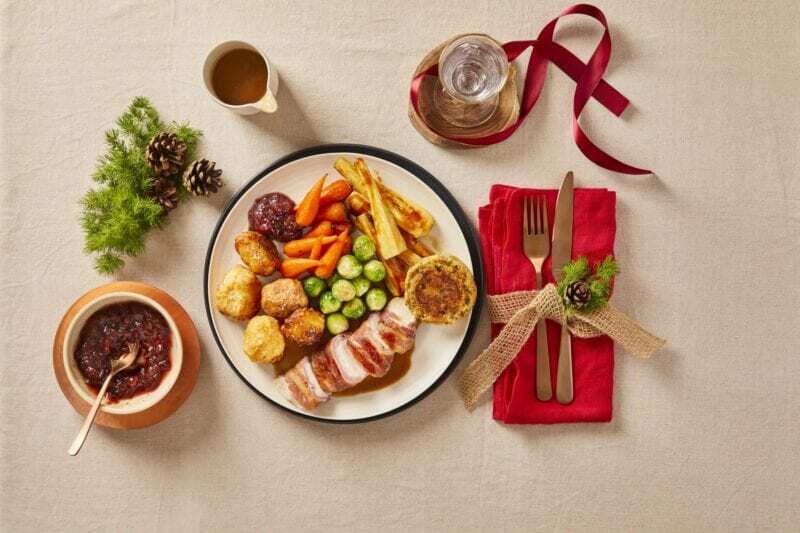 You’ll create your own sage and onion stuffing from scratch, cook up the ultimate crunchy-on-the-outside-fluffy-on-the-inside roast potatoes and serve with chantenay carrots, brussels sprouts, honey-baked parsnips, a gorgeous homemade gravy and a generous dollop of our quick cranberry sauce. 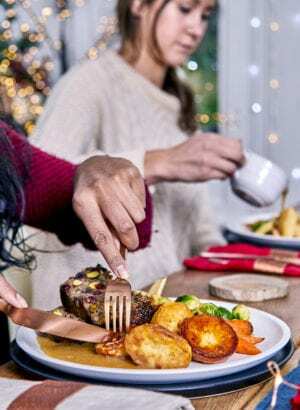 The key to Christmas dinner success is all down to timing, so we’ve planned this one meticulously to make it as stress-free as possible, with all the flavours you know and love ready in under an hour! Never has a nut roast been so simple and delicious! For this vegetarian recipe, you’ll cook up finely chopped onions with tasty portobello mushrooms, combine with sage, lentils, breadcrumbs, mature cheddar, sweet and tangy dried cranberries and raw pistachios. Pop in the oven and roast to perfection. Serve with crunchy golden roasted potatoes, chantenay carrots, Brussels sprouts, parsnips, and lashings of homemade gravy. As with all our Gousto recipes, these come with easy to follow instructions so you can rustle up the most delicious meal of the year without so much as a party hat out of place. 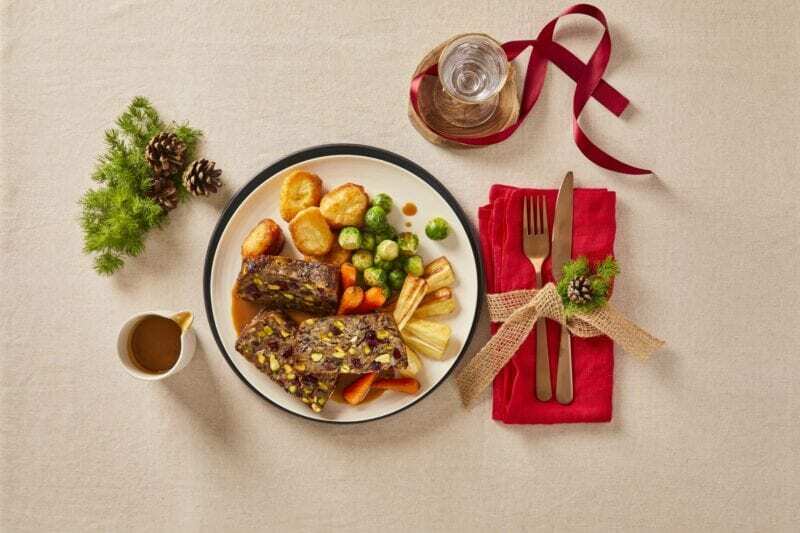 Hungry for a plateful of comforting Christmas food before the big day? 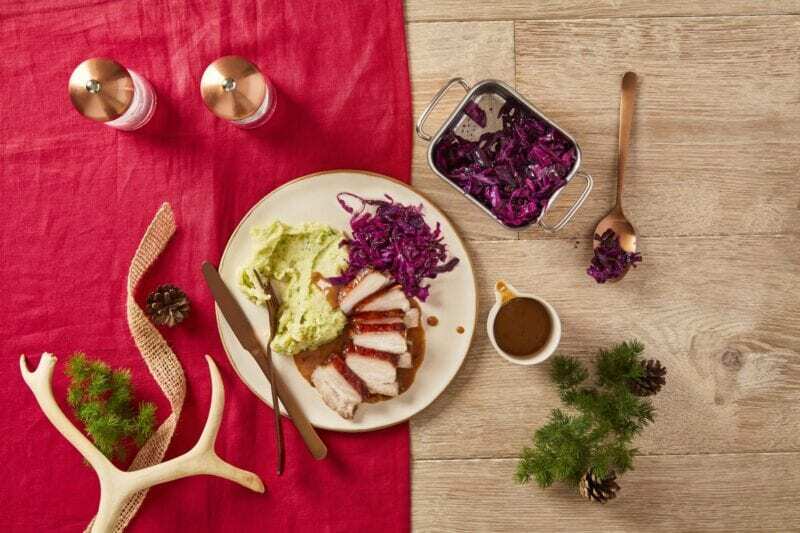 Our Taste Of Christmas recipes tease your favourite festive flavours like cranberry sauce, balsamic roasted sprouts and spiced red cabbage. 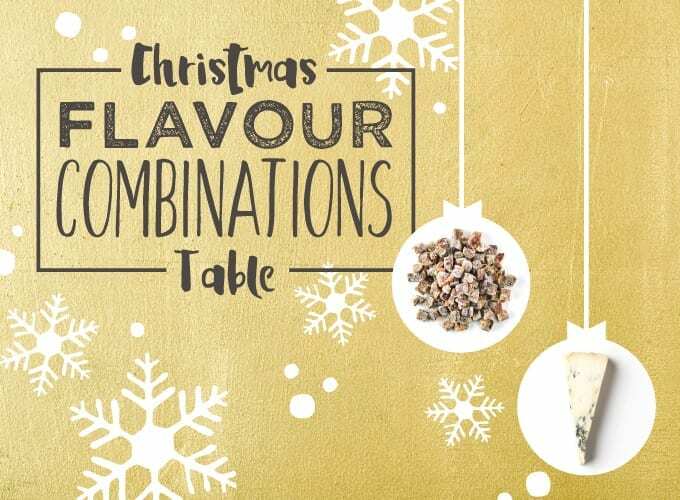 So you don’t have to wait till the 25th to enjoy some tasty Chrimbo classics. It’s like peeking at your presents but it’s totally allowed. Each of our Taste Of Christmas recipes is available on our regular menu for no additional cost. Find the range on the menu now. 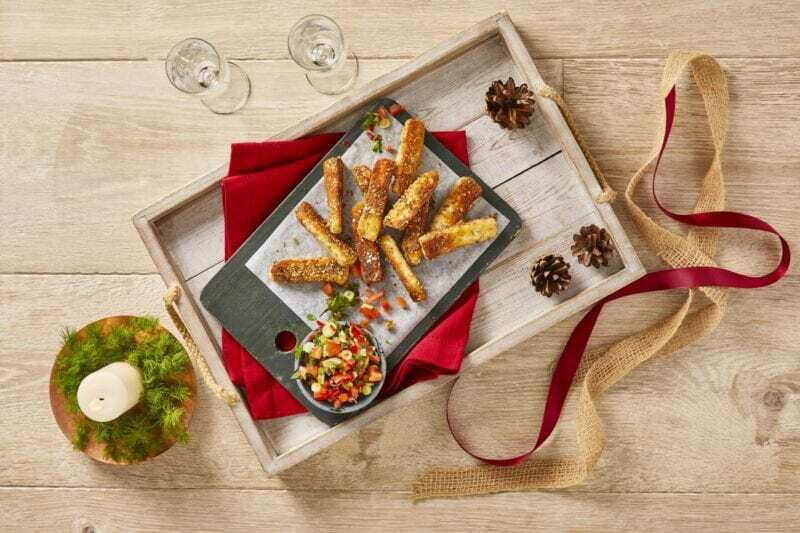 For the first time ever you can now order our new range of Festive Sharers – the perfect canapés or finger food to impress guests or share with family for a light supper before heading out. 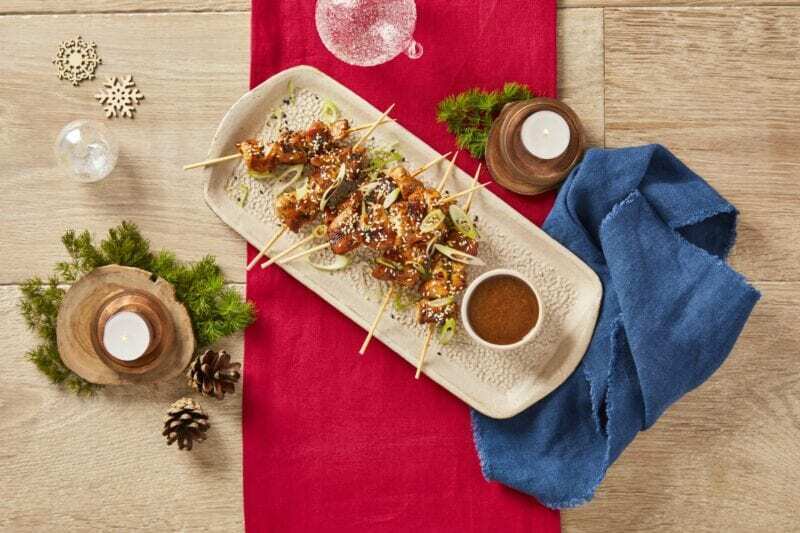 This Japenese-inspired recipe is just the thing to add some extra wow-factor to your festive celebrations. Each portion makes 3 pieces which you can serve as a starter or canapés (depending on how many people you’re entertaining). What is the portion size for a 2 person box? 6 tasty chicken skewers to share as you see fit. What is the portion size for a 4 person box? 12 chicken skewers to enjoy as starters for 4 people or canapés for a group. These delightful morsels are simple, flavour-packed and marvellously moreish. Each portion makes 3 pieces which you can serve as a starter or canapés (depending on how many people you’re entertaining). What is the portion size for a 2 person box? 6 sweet chilli prawn lettuce cups to share as you see fit. What is the portion size for a 4 person box? 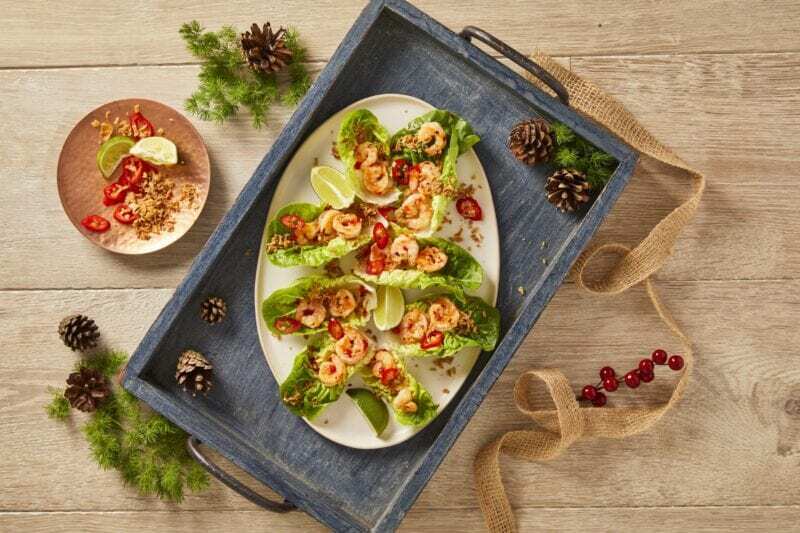 12 sweet chilli prawn lettuce cups to enjoy as starters for 4 people or canapés for a group. Coated in a fragrant mix of herbs, spices and sesame seeds, then fried till golden and served with a zingy tomato salsa these halloumi fries are sure to impress! Each portion makes 3 pieces which you can serve as a starter or canapés (depending on how many people you’re entertaining). What is the portion size for a 2 person box? 12 za’atar halloumi fries to share as you see fit. What is the portion size for a 4 person box? 24 za’atar halloumi fries to enjoy as starters for 4 people or canapés for a group. 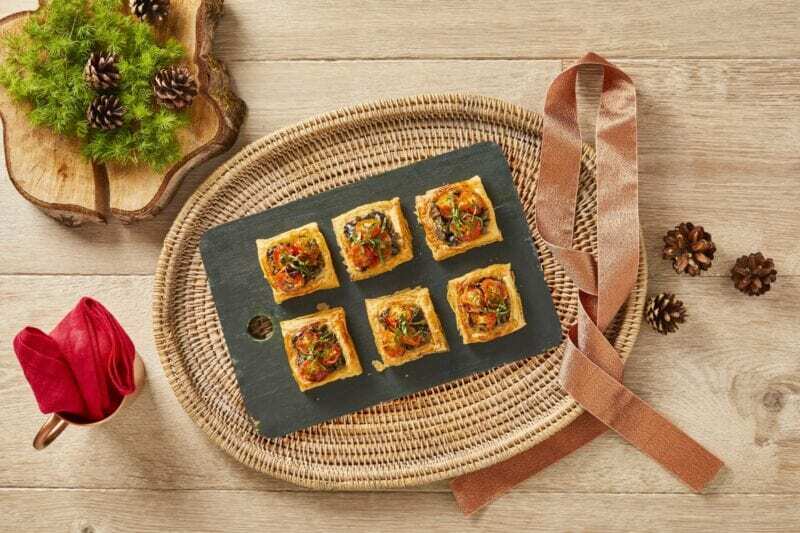 With buttery puff pastry, herb roasted tomatoes and homemade olive tapenade your guests won’t be able to keep their hands off these tasty nibbles! Each portion makes 3 pieces which you can serve as a starter or canapés (depending on how many people you’re entertaining). What is the portion size for a 2 person box? 6 tasty puffs to share as you see fit. What is the portion size for a 4 person box? 12 puffs to enjoy as starters for 4 people or canapés for a group. 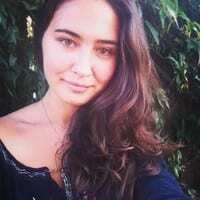 Does the sharing range cost extra? Nope! These recipes are the same price as our regular menu items. Find them on the menu now. We even have some decadent dessert options and a sensational selection of wines in our Gousto Market which you can add to your box after you checkout. If you’ve already got an order on the go, log into your account, click the ‘Deliveries’ tab and view your upcoming boxes. 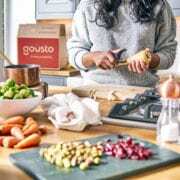 Then choose to ‘Shop Extras’, and then you’re ready to add Gousto Market items to your box. Have a happy Christmas from everyone here at Gousto!